Our Qualified technician at Fridge0 Refrigeration will come to you with no call out fee and deliver same day service. 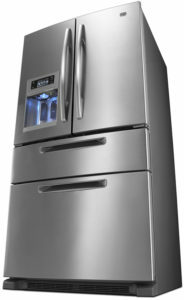 We do Maytag refrigerator services & repairs in the Eastern & South Eastern suburbs of Melbourne. models but there are still some designed with no or minimal electronics integrated into the designs. is still on. When the fridge or freezer door is opened the unit starts to work. only when the doors of the fridge are opened. In this instance, the main board needs to be repaired or replaced. The most common cause of the Maytag refrigerator tripping the safety switch is due to the heating element located in the freezer side of the unit. This needs to be replaced for correct operation to resume. The second most common is a faulty compressor which may cause the refrigerator to start tripping the safety switch. Once it is found to be the compressor causing the problem then it needs to be replaced for correct operation to resume. Third most common issue is the termination thermostat which is directly inline with the defrost heater. This part needs to be replaced. Refrigerator compartment isn’t cooling as well as it should if at all, but the freezer seems to be ok or the bottom part of the freezer is ok but the top half is thawing out and there is noticeable ice/frost build up on the back wall of the freezer on the bottom section. Most likely reason for this symptom is related to the heating element, which needs to be replaced, and freezer coil needs to be defrosted and all ducts connecting the freezer and fridge need to be unblocked. Termination thermostat has failed and needs to be replaced. Freezer coil needs to be defrosted and all ducts connecting the freezer and fridge need to be unblocked. Refrigerator compartment seems to be cooling ok but the freezer compartment is not cold enough and my product is slowly thawing out. Most common reason for this symptom to occur is due to a gas leak. Somewhere in the refrigerator system corrosion has occurred causing a copper line to crack or fracture letting the refrigerant to escape slowly, The symptom can be observed on the evaporator coil inside the freezer compartment when only a very small section of the coil is iced or frosted over. Solution is gas leak needs to be located copper or steel line needs to be either welded or replaced followed by a procedure ending with recharging the system with refrigerant. Second most common issue is a system blockage. Symptom is exactly the same as a gas leak but is actually a blockage causing the refrigerant not to flow through the system as intended to do so. Solution is to replace both the filter dryer and usually the valving system which is a capillary copper tube and recharging with refrigerant.